Supporting health through research and education. The Manitoba Medical Service Foundation gratefully acknowledges the generosity and support of corporate partners who have helped fund research grants contributing to furthering research in Manitoba by supporting health through research. Listed are current and previous partners to the Foundation. The MMSF grant review process selects new grant applicants who subsequently showed statistically greater academic productivity, by number of publications, publication impact (h-index) and funding from Tri-Council (TC) grants received. As measured by Tri-Council (TC) funding received, there was a substantial economic local multiplier effect, a Return on Investment (ROI) for the MMSF operating grant program, of 9 fold by the successful MMSF applicant as a Principal Investigator (PI) for TC grants, and of 34 fold for the successful MMSF applicant as a participant on TC grants. We recognize that there are many factors which influence the success of new Manitoba researchers. We do not attribute researcher success only to MMSF grants, but hypothesize that MMSF contributes to the success of MMSF applicants. 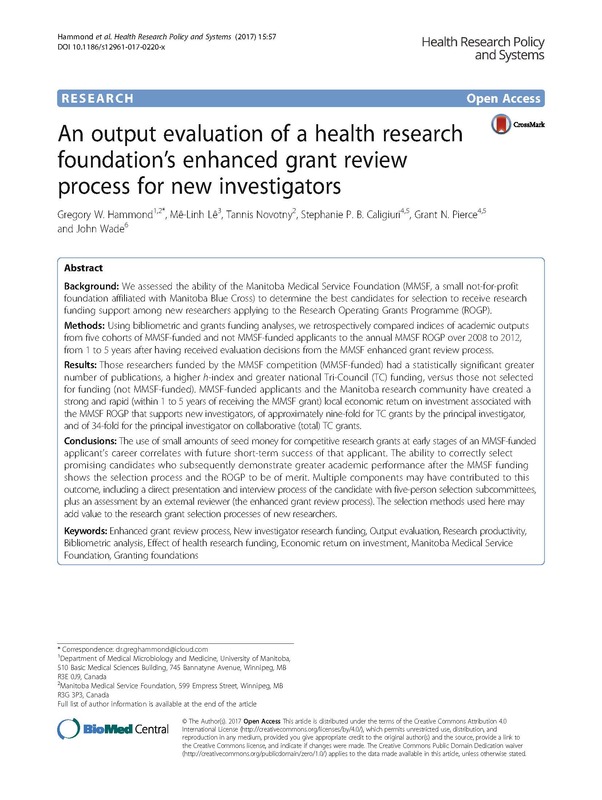 In June 2017 a research paper (research by a team from the MMSF, the University of Manitoba and the St. Boniface Hospital Albrechtsen Research Centre) on the above topic was published in Health Research Policy and Systems – BioMed Central, detailing the above outcomes of the annual MMSF operating grant competition review, titled ‘An output evaluation of a health research foundation’s enhanced grant review process for new investigators’ , by Gregory W. Hammond, Mê-Linh Lê, Tannis Novotny, Stephanie P. B. Caligiuri, Grant N. Pierce and John Wade. Click here to view the research paper. We conducted a review of the recipients of the above award over a 10 year period from 2003 to 2012, to see if the award was achieving its’ intended goal of providing advanced training and recruitment to faculty at the University of Manitoba. Results showed that all 12 recipients who accepted the award over this period currently have academic clinical positions at the University of Manitoba. The above two programs respectively account for 71% and 2% of our total historical funding of MMSF awards. We examined the candidates who had applied to the Professorship Awards, since inception to 2016. Results showed that of 28 award winners, 27 are currently academic members of the University of Manitoba and many are leaders in their respective fields. The other Professorship award winner has become a Department Head at a large University in the USA. These are impressive results by the award winners and show the quality of the candidates, and the ongoing benefit from our investment in them. The Professorship Awards accounted for an additional 16% of our MMSF funding. Altogether over the past three years we have conducted reviews of programs which account for 89% of our program funding, with positive results, as above. The BSc Med  and BSc Dental  programs, which combine for an additional 7% and 2% respectively of our fund expenditures, have previously been evaluated and publications have shown the merit of those programs.